Cherished friends, the mystical connection between parents or grandparents and children, the bonds of intimate partners: Relationships are the thread running through and connecting our lives. HeartMath research shows the heart is essential in helping us find true meaning in life, that heart-based social connections can energize and give us greater purpose. Families form the foundation of our social connections. Parents, siblings and other relations teach us how the world works. Though our social connections inevitably expand, our family ties and lessons endure. 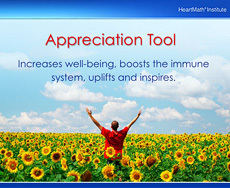 Ideally, we learn to recognize and express appreciation, care, compassion and love – habits of the heart – within our families. These qualities are the fabric of what HeartMath calls heart-based living. There are many practical tools and materials to help families learn to live life from the heart. The workplace is a special part of our lives, one where shop talk, little things that happened today or last week and other factors form the basis of these unique social connections. Connected communication between coworkers can produce synchronicity and cohesion in the work environment. It begins by engaging the heart in our communications and interactions with the people in our lives. We’d all love to do well or see our children do well in school. Often, peer pressure, life’s demands, emotional turmoil or things like test anxiety can inhibit us and prevent us from doing our best. School can become tiresome and uninteresting. Students of all ages who learn to utilize the intelligence of their hearts, however, find that learning actually can be fun and purposeful. 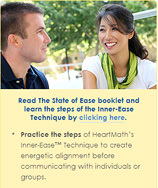 HeartMath has practical, science-based solutions to help families, students, workers and others strengthen and find greater purpose in social connections. 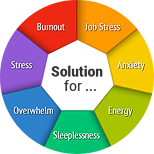 Among these are anxiety, job pressure, sleeplessness, overwhelm and fatigue. These personal tools have been shown to reduce stress and add greater ease and balance to daily activities. Learn to effectively connect with your own and others’ hearts. This collection of articles has information, tips and inspiring stories to help you learn more about social connections and how to enhance your own connections and journey through life.